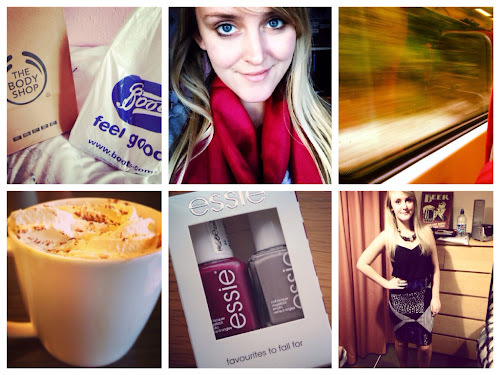 This is the 5th week of my Instagram Update and I've got more photos for you this week! I've been spending the week in Southampton so I've been up to a few non-related work things. On Sunday, I went shopping with my mum to get some make-up and other beauty bits. I did a haul post on Monday about the bits I got, which you can find here. I am absolutely loving White Musk: Smoky Rose Body Lotion - the smell is absolutely amazing and I can't stop smelling myself when I have it on. I realise that sounds a bit weird. I also bought a scarf from an Indian dress shop; this is another that I mentioned in a post - Overnight Essentials. It was only £1 but looks a lot more expensive. On Wednesday I left for Southampton, I have a week off work so I wanted to spend time with my boyfriend. We went shopping on Thursday to check out the Christmas decorations in John Lewis. He was adamant it was much too earlier but came round after seeing how nice the decorations were. We went into Starbucks and I tried their Orange Hot Chocolate off their festive menu, and it was amazing! It tasted like a Terry's Chocolate Orange. I also managed to drag him into Boots and buy a bit of make-up - it is 3 for 2 on all cosmetics! I finally got my hands on some Essie nail polishes, it's a set that was £12.99. If you saw my Mini Make-Up haul this week you would have seen this featured. I met up with a few friends on Friday night and the bottom right photo is an OOTN. I wore a Topshop cami and skirt from their petite section. It was lovely catching up with my old housemates. Yesterday, I watched my boyfriend play hockey for his uni, it was absolutely freezing but I bought a hot chocolate with marshmallows to warm up. He won so I wasn't freezing for two hours for nothing! It was really nice to see him play because I've never watched a match before. I'll definitely be asking to go to a few more! I hope you all had a lovely week and a fun weekend! I'm back to work next week so expect a less exciting update. I love your OOTN the skirt is gorgeous, PLUS I'm so short so this is great to know it's in the petite section. You look great!